Keeping pictures on your iPad helps you go through some of your favorite memories. While the iPad’s Picture Frame is a great and convenient feature, it may get you into some privacy trouble. What happens if you don’t want everybody who gets their hands on your iPad be able to access with a simple tap the photos you’ve taken? Knowing how to turn off Picture Frame on iPad can prevent you from unwanted intrusions. Even if your device is password protected, the pictures you have stored on your iPad are still one tap away. It is very easy for someone who ends up using your iPad to accidentally tap that button and next thing you know you will find yourself sharing private pictures with the world. Disabling the Picture Frame button from the lock screen is your best protection against that. 3. Scroll down and tap on “Passcode Lock”. 6. Tap on the Picture Frame switch. 7. Turn off the Picture Frame feature on the iPad’s lock screen. 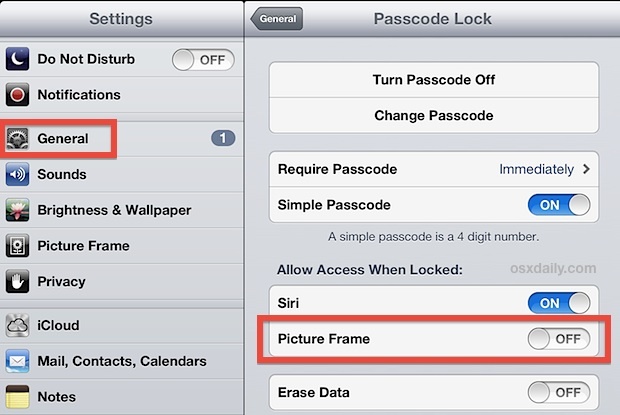 It is done – your Picture Frame button from the lock screen has been disabled. 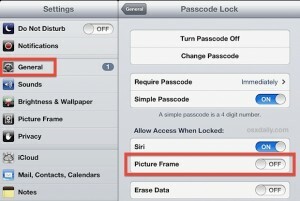 Now that you know how to turn off Picture Frame on iPad you can keep your photos secure and private. If you want to turn your iPad into a picture frame or slide show, you can do it manually from the Photos app. If you’ve enjoyed this guide – and we hope you did – make sure you go through the rest of our iPhone and iPad tutorials.